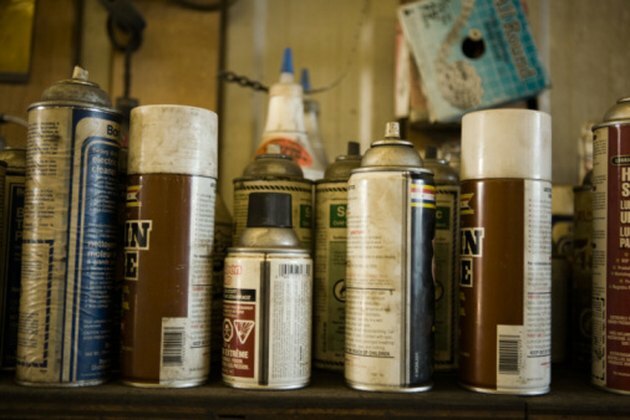 There are a few different scenarios that might require you to remove spray paint from wood. You may have spray painted a wood object in your home, such as a chair or wall, and would now like to get it back to its natural wood finish. You might have also accidentally gotten some spray paint on a wooden surface. Graffiti is often done in spray paint, and if there is graffiti on your wood fence or shed, you probably want to remove it as soon as possible. Spray paint can be easily removed from wood. Pour a generous amount of acetone solvent onto a rag. This type of solvent can remove dried spray paint. Apply the acetone solvent directly to the wood surface. Again, add plenty of it. Allow the solvent to sit on the wood surface for several minutes. This allows it to penetrate the wood and will be more effective at removing the spray paint. Add more acetone solvent to a new rag and start scrubbing away the spray paint. Continue using new rags as one gets covered in the paint. Eventually, you should reach the bare wood. Rinse the wood surface with water to remove leftover paint remnants and solvent.